The 1960 presidential election was the closest election since 1916, which can be explained by a number of factors. Kennedy benefited from the economic recession of 1957–58, which hurt the standing of the incumbent Republican Party, and he had the advantage of 17 million more registered Democrats than Republicans. Furthermore, the new votes that Kennedy, the first Roman Catholic president, gained among Catholics almost neutralized the new votes Nixon gained among Protestants. Kennedy’s campaigning skills decisively outmatched Nixon’s. In the end, Nixon’s emphasis on his experience carried little weight, and he wasted energy by campaigning in all 50 states instead of concentrating on the swing states. Kennedy used his large, well-funded campaign organization to win the nomination, secure endorsements, and, with the aid of the big-city bosses, get out the vote in the big cities. Kennedy relied on running mate Lyndon B. Johnson to hold the South, and used television effectively. There were 14 unpledged electors and one faithless elector in the election. All eight electors from Mississippi, as well as six of the 11 electors from Alabama, were unpledged and voted for the Byrd/Thurmond ticket, while one faithless elector from Oklahoma voted for the Byrd/Goldwater ticket. John Fitzgerald “Jack” Kennedy (May 29, 1917 – November 22, 1963), commonly referred to by his initials JFK, was an American statesman who served as the 35th President of the United States from January 1961 until his assassination in November 1963. Kennedy served at the height of the Cold War, and much of his presidency focused on managing relations with the Soviet Union. He was a member of the Democratic Party who represented Massachusetts in the United States House of Representatives and the United States Senate prior to becoming president. Kennedy’s time in office was marked by high tensions with Communist states in the Cold War. He increased the number of American military advisers in South Vietnam by a factor of 18 over President Dwight D. Eisenhower. In April 1961, he authorized a failed joint-CIA attempt to overthrow the Cuban government of Fidel Castro in the Bay of Pigs Invasion. He subsequently rejected plans by the Joint Chiefs of Staff to orchestrate false-flag attacks on American soil in order to gain public approval for a war against Cuba. In October 1962, U.S. spy planes discovered that Soviet missile bases had been deployed in Cuba; the resulting period of tensions, termed the Cuban Missile Crisis, nearly resulted in the breakout of a global thermonuclear conflict. Domestically, Kennedy presided over the establishment of the Peace Corps and supported the Civil Rights Movement, but he was largely unsuccessful in passing his New Frontier domestic policies. Kennedy continues to rank highly in historians’ polls of U.S. presidents and with the general public. His average approval rating of 70% is the highest of any president in Gallup’s history of systematically measuring job approval. 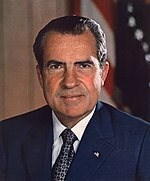 Nixon ended American involvement in the war in Vietnam in 1973 and brought the American POWs home, and ended the military draft. Nixon’s visit to the People’s Republic of China in 1972 eventually led to diplomatic relations between the two nations, and he initiated détente and the Anti-Ballistic Missile Treaty with the Soviet Union the same year. His administration generally transferred power from Washington D.C. to the states. He imposed wage and price controls for ninety days, enforced desegregation of Southern schools and established the Environmental Protection Agency. Nixon also presided over the Apollo 11 moon landing, which signaled the end of the moon race. He was reelected in one of the largest electoral landslides in U.S. history in 1972 when he defeated George McGovern.